I asked my Tweeps if they do VRG for this or let students choose. Almost everyone said they let students choose. I may try VRG next time as there were a couple of students who didn’t get up to talk to anyone. I’ll be asking them for feedback today about how they thought that helped them (or whether or not it did). Unfortunately on test day due to an assembly running long that morning, they took 10 minutes away from my period. A number of students had trouble finishing. I struggle with that b/c I think many of them want more time, but simply spend the time staring at the page, not being productive in solving. This class is mostly ELLs thought (more than usual) and in the past when that’s been the case & I have slower test takers I have made shorter more frequent tests. So normally I test ever 2 to 3 weeks once we’ve done activities & practice that cover 4 or 5 of the 9 overall expectations for the course. Then the test is 2 pages double sided, each side of a page is 1 overall expectation (usually one or two problem solving tasks). In the past I’ve changed that to testing every 1 to 1.5 weeks on 2 of the 9 expectations instead. I think that’s what I’ll need to do here so that if a student needs more time they can have it within that class period. I haven’t yet returned their marked tests (I put feedback only on the test & they receive their grade separately a day later on their evidence record via email; research shows that mark + feedback results in students caring only about the mark, not the feedback). 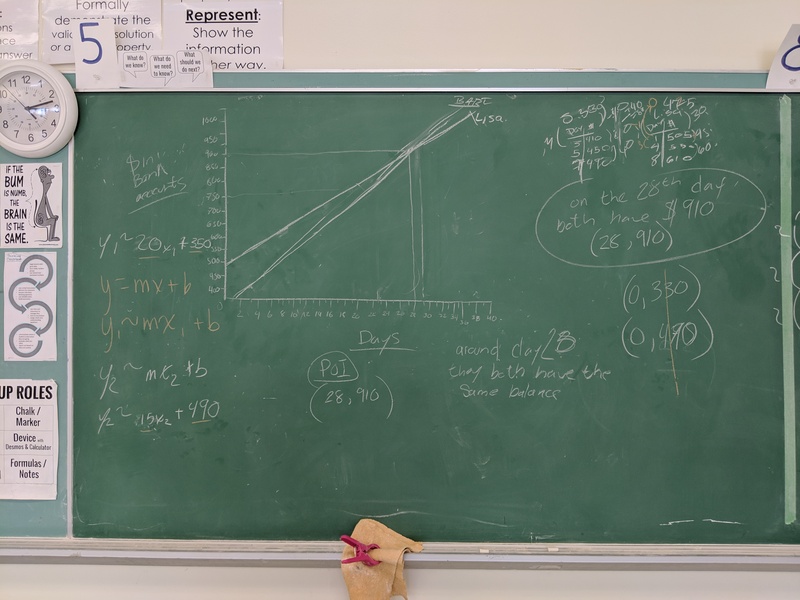 Yesterday I sketched on the board the same triangle based prism they’d had in a Toblerone bar question on the test but with different dimensions. I asked them to find surface area & volume (dimensions were such that they needed to use Pythagorean Theorem to find the height of the triangular base). Most groups took almost the entire period to solve this!!! One group never got beyond the Pythagorean Theorem part. I ran around like a chicken with my head cut off trying to facilitate, correct misconceptions, etc. 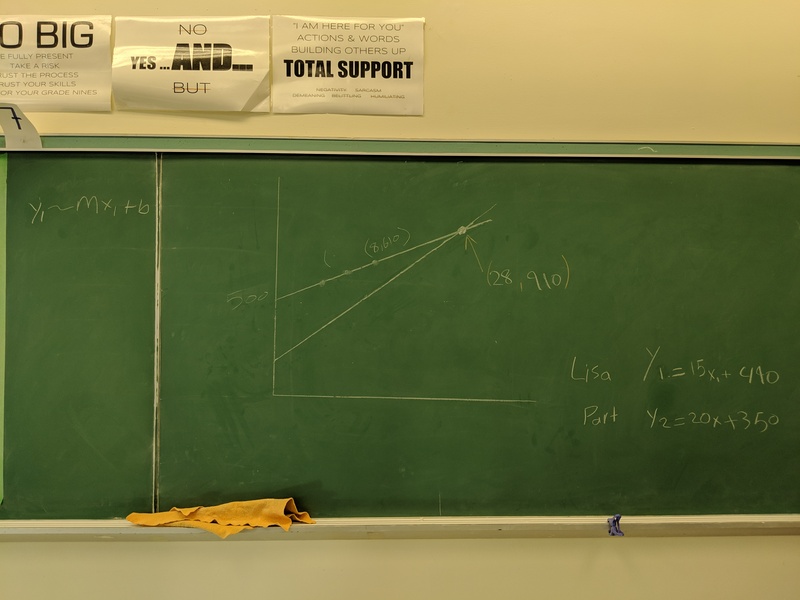 As an aside: A colleague came by to watch (said he’s been meaning to for a while now) and I had to ask him not to write on the students’ boards or tell them how to do the next step. Reminded me how hard it is to teach other teachers the skill of not telling students the answers always, but asking questions that help them figure it out for themselves. He said “but they’re nodding so they understand what I’m showing them”. I explained I want them doing the math, not him. I asked him to talk with them but don’t do the math for them. This is my 2nd or 3rd time doing this activity, but hadn’t yet blogged about it. So here goes … I made lots of changes, even from one period to the next. 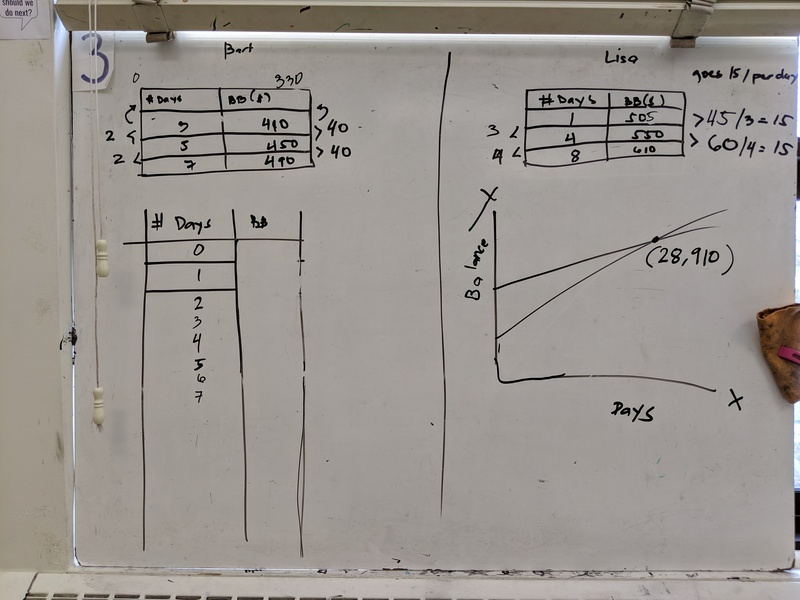 At your boards (whiteboard / chalkboard) in groups of 2-3 randomly assigned (VNPS & VRG). Most groups started calculating the cost per person for each teacher. I stressed to them multiple times that all 3 teachers were paying along the same formula or “price plan”. They really struggled with how that could be. In first period there was 1 group whose board had a table on it & they had started using 1st differences to calculate the rate of change. 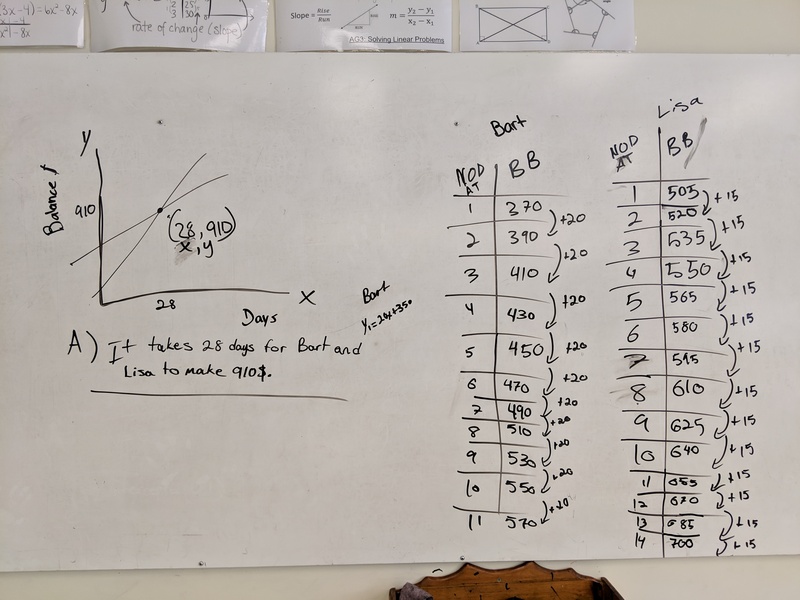 I called all the groups over & led a discussion about the strategy and asked about what sort of deposit (a cost for 0 people) might have to be made by the teachers & sent all the groups back to continue, strongly urging them to explore the table idea. In 3rd period, none of the groups started the table, so I called all the groups over to some spare board & said “here’s something I saw in 1st period” & proceeded to have the same conversation with them. We got to the point on day 1 where everyone solved for the cost for 150 guests. Time ran out, & bell rung. Between periods 1 & 3 today I added some extra slides & questions to my slide deck to make it better. I asked them if this was linear or nonlinear. Why? In 1st period this also resulted in a conversation about 1st differences when the x values don’t have a constant increase. I asked if the line of best fit would pass through the origin? 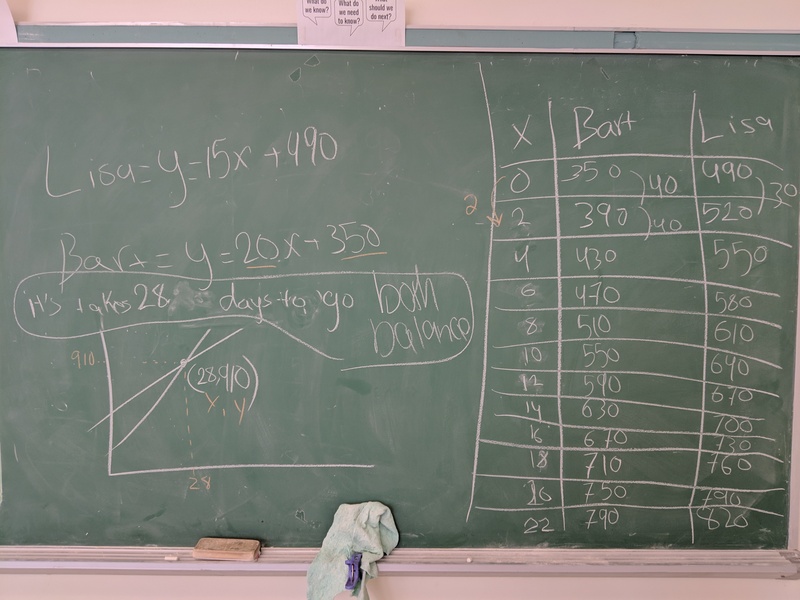 Once they had done a linear regression to find the equation, I asked them to use their equation to solve for the number of guests I invited if my party cost $3545 at the banquet hall. 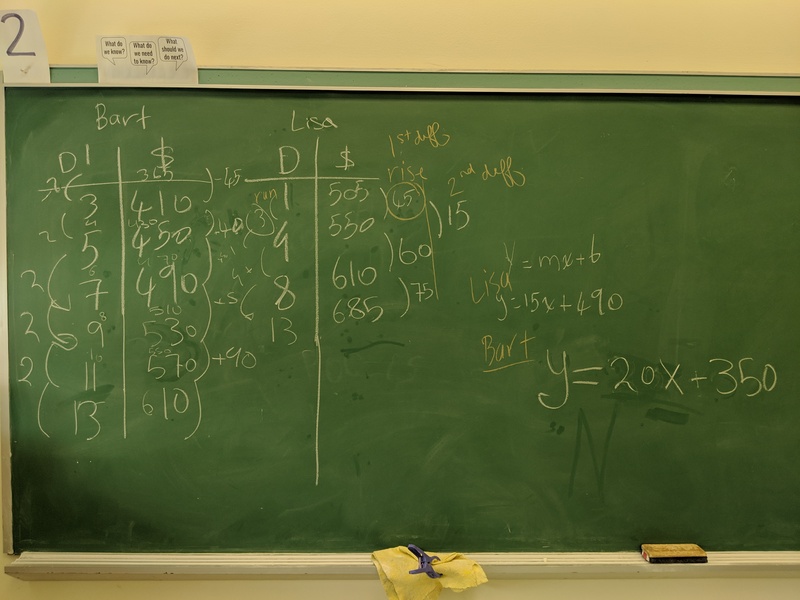 I coached a few groups through the proper format in which to show their work when solving an equation. The rest of the period was dedicated to individual practice on a Khan Academy problem set called “Slope intercept equation from graph“. Find the whole lesson here (the unassociated file is Pear Deck). How do you handle it when students question your teaching skills or pedagogy? Let me know in the comments below! Here is a tree height 3 act math activity I do for right angled trigonometry with both my 2D & 2P classes. The screenshots below were taken from my 2P class this semester. Students downloaded a clinometer app onto one of the phones in their group. 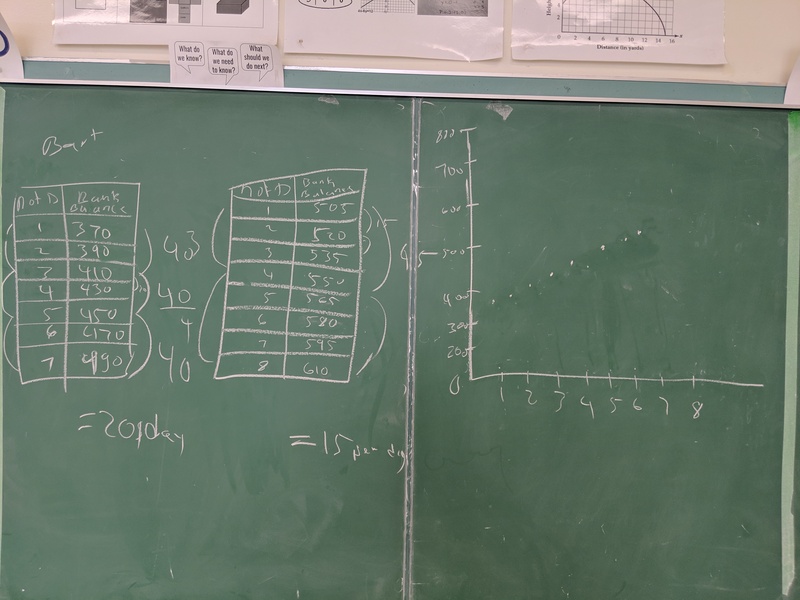 This is one activity I don’t have a true act 3 for – I don’t know the actual height of this tree 😦 I led a class discussion going over the solutions from various groups. We discussed the fact that trig would not find the whole tree height & that groups needed to add the height of the person up to eye level to their value found using trig. I sent groups back to their boards to adjust their solution for this (final photos above). The whole activity, including the Pear Deck file, can be found here.